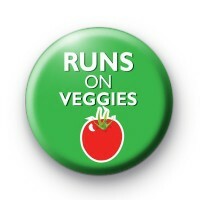 Bright green 1-inch badge with the fun slogan, Runs on Veggies written in a white font and a bright red tomato at the bottom. Ideal if you are Vegan or Vegetarian and love to eat vegetables. Vegetables are delicious, full of nutrients and keep your body and mind healthy. We have lots of fun Veggie and Vegan themed badges in the shop and they're great for activists and vocal members of the ever-growing Vegan community.